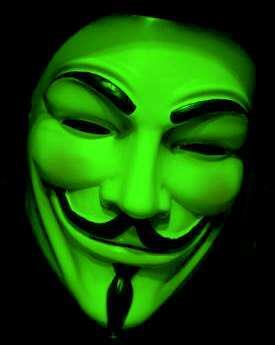 Police are concerned about our MardiGrass protest plans and we agreed people are not to trespass on the Police Station land nor blow smoke in any police faces. Either act will give cause for arrest. We have agreed to again this year march from the copshop along the traditional route to Peace Park, not from Peace park to the Police Station as originally planned. 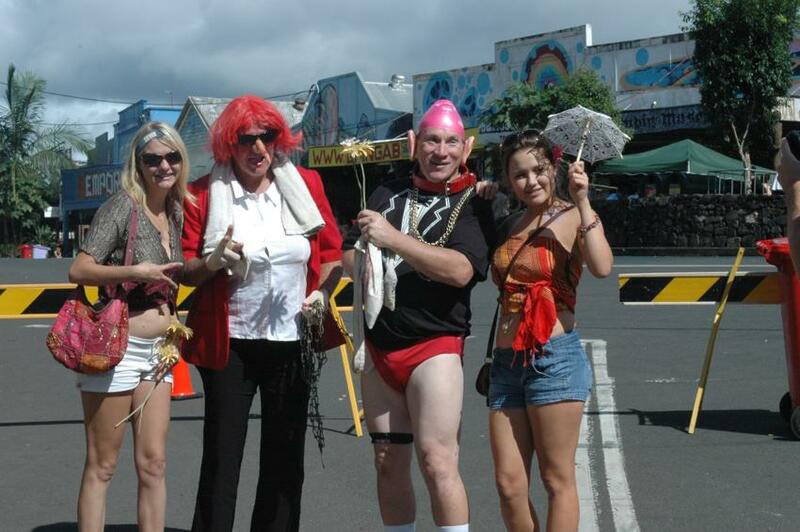 Police want the MardiGrass weekend to be non confrontational and we agree. It’s critical we are peaceful protestors and respect is maintained. They want to emphasise they don't make the laws and they support our right to protest and in particular support our protest march in Lismore on May 1st to the two local politicians offices, Janelle Saffin and Thomas George, who do make the laws. WHY SHOULD I BUY THE GOLDEN BUD PASS? Because MardiGrass can’t happen or continue if you don’t. Because it gives you free access to all events in Peace Park (The Home of the Hemp Olympix), the Town Hall and the Bush Theatre. 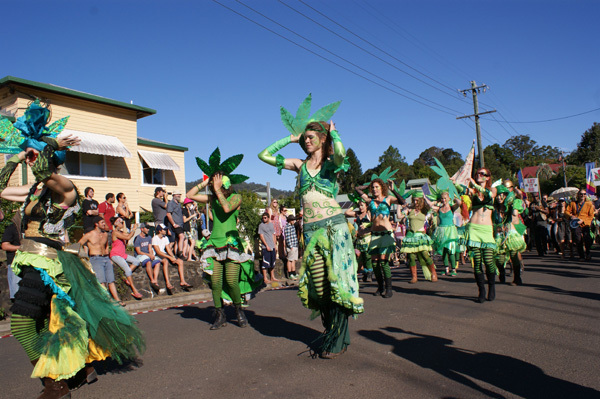 Because some events like the Comedy Cabaret and Joint Rolling will fill the Town Hall which has limited capacity and Golden Bud Passes get priority entry. Because you are supporting cannabis law reform which is what MardiGrass is all about. Because the Council and Police have given us so many rules and regulations to comply with, the whole event is in danger of folding if you don’t. Because you can’t get entry into the Hemp Bar, Mullaways Magic Medicine Tent or other venues without the Golden Bud wristband. Because the showground camping team are all volunteer legends who will look after you with genuine old style Aussie country hospitality and you’ll have a terrific weekend. Because you’ll feel really good about yourself contributing to a worthwhile cause. 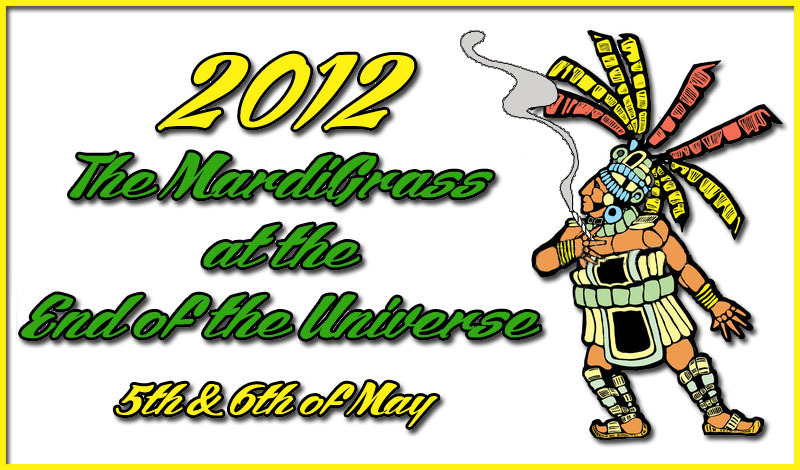 MardiGrass plans are up and running but it will be different this year! 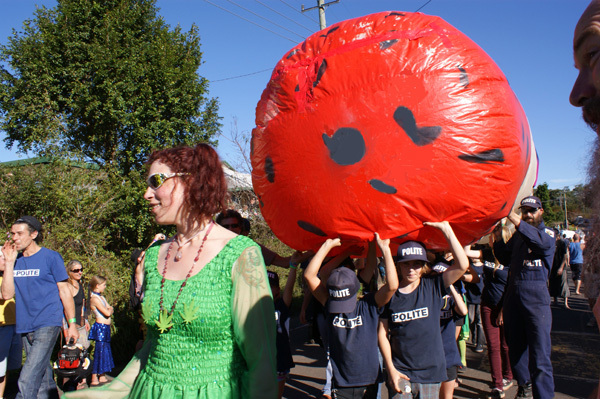 The MOB (MardiGrass Organising Body) was asked if the annual event was a protest or a festival by the Lismore Mayoress no less. We were in no doubt about the answer. There will be changes but nothing is written in ink yet and we are still negotiating with Lismore Council over details. Sibley Street may not be closed and the glorious new skate park has halved the traditional HEMP Olympix Arena, but the real point of MardiGrass - Cannabis Law Reform - remains more real than ever. The helicopters have been buzzing the area recently and if we needed reminding that the drug war steams on unabated, the chopper crew did a good job. “War is over if you want it”, said John and Yoko, and we certainly want it to be over. The meetings have been unanimous in wanting to bring back the seriousness of how much cannabis prohibition stuffs up peoples lives so unnecessarily. We begin our protest this year on Tuesday the first of May, with Occupy Lismore Court House, where so many lives are disrupted by the drug war, before we proceed to the Police Station (next door! ), then to Federal MP Janelle Saffins Office, and finally local NSW MP Thomas Georges Office. Letters will be delivered to the politicians asking for change on the cannabis laws, asking them to have another look at these laws and what effect they have on the community. Do they really believe that we are criminals? NO. Yet these two are our government representatives in Parliament and they both support the war against us. They both support criminalising us for using a plant from nature! And they both have children in trouble from the drug war! Why is Australia being left behind on drug law reform? The Greens seem spooked by the matter even though it is a social justice issue of paramount importance. Under our present antiquated political system, if the Prime Minister said, ‘let's trial medical cannabis’, the opposition would hysterically scream, ‘she wants to give away heroin’. The madness emanating from government and media over this issue is no different from the attitudes of the 1950s! We need leaders with vision to sit in a circle and examine the facts and make decisions that are good for society. Good for happiness levels! We are still competing with each other like animals, when to make things better, we need to co-operate...like smart animals! Tickets for MardiGrass are for sale on the website and we recommend you purchase now if you want a campsite. The 2012 draft program will keep changing. This year we are looking for some special skills amongst our volunteers - particularly local volunteers - Traffic Controllers will be treated like gold, Jungle Patrol will again provide their exemplary service and needs local members in particular, as does CLOG the Civil Liberties Observer Group. 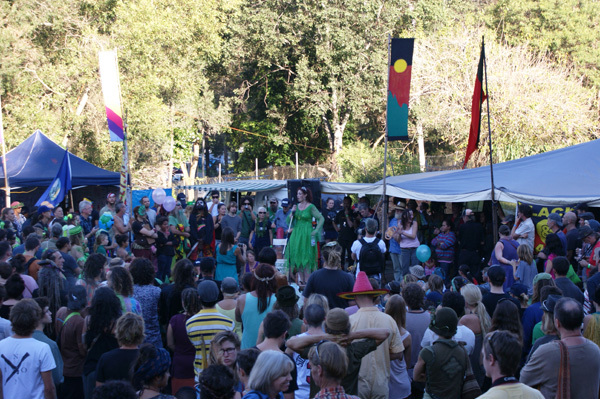 MOB (MardiGrass Organising Body) meetings are on the back verandah of the HEMP Embassy every Friday now from 5 pm, and everyone is welcome. If you have an event or something you want to see happen, let us know sooner rather than later. Hemp masonry is a mixture of hemp fibre, lime and binding agents, and it has been used by humans for millennia in a similar way that modern humans use cement. The Egyptians sealed their tombs with hemp masonry, and the remains of a thousand-year old bridge still stand in France. Klara Marosszeky from Australian Hemp Masonry Company has spent 13 years researching and developing all aspects of the hemp masonry industry, from cultivating and harvesting techniques to processing and manufacturing technologies. AHMC now provides hemp masonry products and expert advice to the local building industry and has a focus on developing low-cost and appropriate housing for Aboriginal Communities. Klara has been amongst the most active pioneers of the Australian hemp industry. She works closely with farmers to develop agronomic skills and biological farming methods, runs hemp building workshops, and she is being instrumental in integrating education about hemp production into the mainstream vocational education sector. Klara is an executive of Northern Rivers Hemp Inc. and is currently working with Northern Rivers Regional Development Australia on the Green Industries Report regarding hemp and regional hemp industry development, and assisting NSW Aboriginal Business Development to make training in hemp building and hemp housing available for communities. Hemp seeds and hemp seed oil have been used by many cultures around the world as a staple food, a fuel, and a component of health-care products. Most countries in the world now allow hemp seed food products to be sold for human consumption, however Australia is a notable exception. In 2002 Food Standards of Australia and New Zealand (FSANZ) supported an application for hemp seed as a novel food but it was rejected on political grounds by the Howard Government, who claimed that it would send the “wrong message” about cannabis. A new application, instigated by Dr Andrew Katelaris, is currently under review. Although FSANZ continues to support hemp as an acceptable and valuable food source, the process continues to be delayed for political reasons. Despite the current ban on hemp seed foods, they are increasingly available in Australia in organic and health shops, and via the internet. In anticipation of a change in legislation, Andrew Kavasilas who is President of Northern Rivers Hemp Inc., is currently growing hemp under license to develop seedstock for food and oil production in collaboration with local organic farmers. The first stirrings of the local hemp industry started at Southern Cross University (SCU) when Dr Keith Bolton began using hemp as a means of cleaning sewage effluent, demonstrating that hemp can successfully clean effluent passing through the soil/root zone while producing high yields of quality fibre in short crop cycles. This early research brought other players into the region including EcoFibre who conducted much of their early research and maintenance of their germplasm collection. Southern Cross University has also hosted researchers investigating medicinal properties of cannabis, and the Centre for Phytochemistry at SCU provides analytical services to the local hemp industry including analysing THC concentrations in crops. Lise Bolton, director of local company Ecotechnology Australia, has recently commenced research into the use of hemp to remove pollutants from land which previously supported tobacco production. Brutus, "Julius Caesar" , Act IV, scene iii. The MOB wishes to extend a welcome and many thanks for those who donate their time and finances during this event, without you it could not happen. 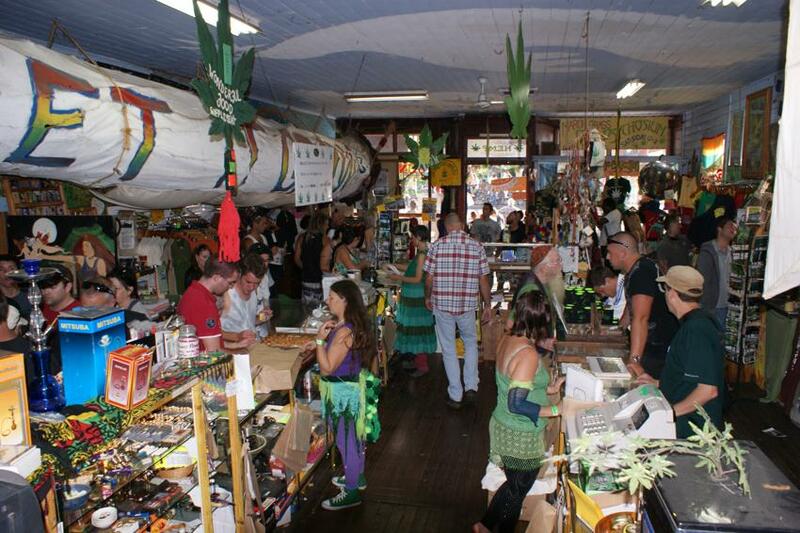 All volunteers should register with the Hemp Embassy leaving a contact phone or email in the shop. MOB meetings have sort of started and you will find key organizers in the Hemp Bar from 4.20pm on Fridays. Event tickets including a campsite are already for sale for the weekend of May 5th and May 6th, 2012………. Not so far away now. There are lawyers everywhere these days, not just in Parliament but in the MardiGrass crowd looking out for you. Here’s some sage words from two of them. The Police may breathalyse you for alcohol or swab you for cannabis. 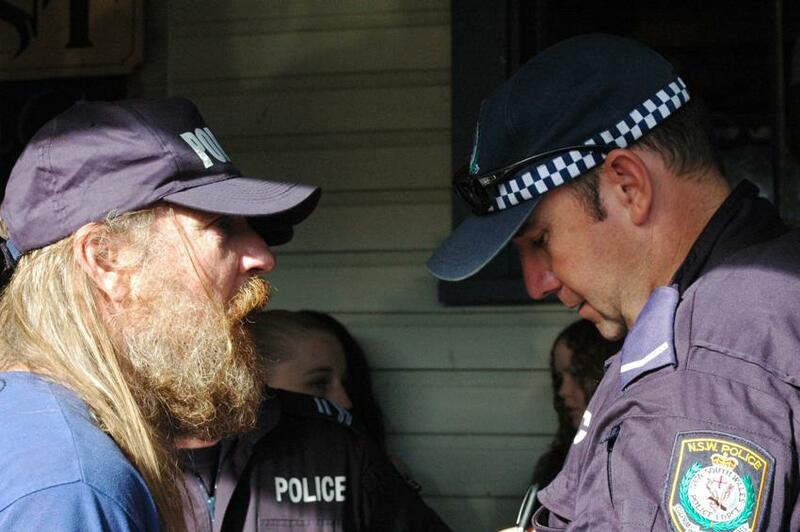 If you haven’t had a smoke that day you should be alright (so wait till you get to Nimbin). 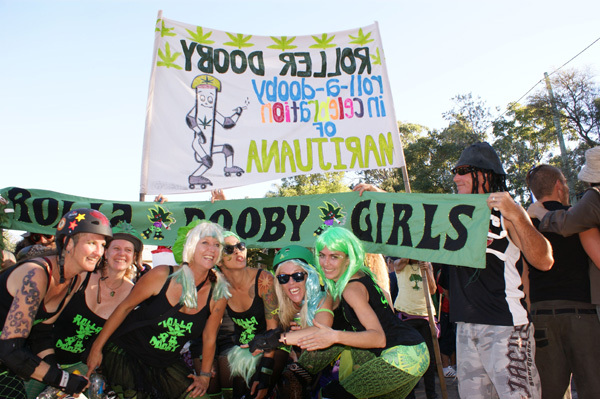 If you must bring cannabis to Nimbin (sorta like coals to Newcastle) then come a few days early. If you must carry it in a car then put it on the floor under a mat or a seat and don't ever say “that’s mine” if it happens to get found. Check www.nimbinmardigrass.com for current road conditions and information. We hope to have the Polite drones operating with the latest on the roads. There are several different routes into Nimbin available. The scenery and country is beautiful. The town is welcoming. The event is unforgettable. And if the issue is your issue don’t be put off no matter what. See you here on the 5th and 6th of May? 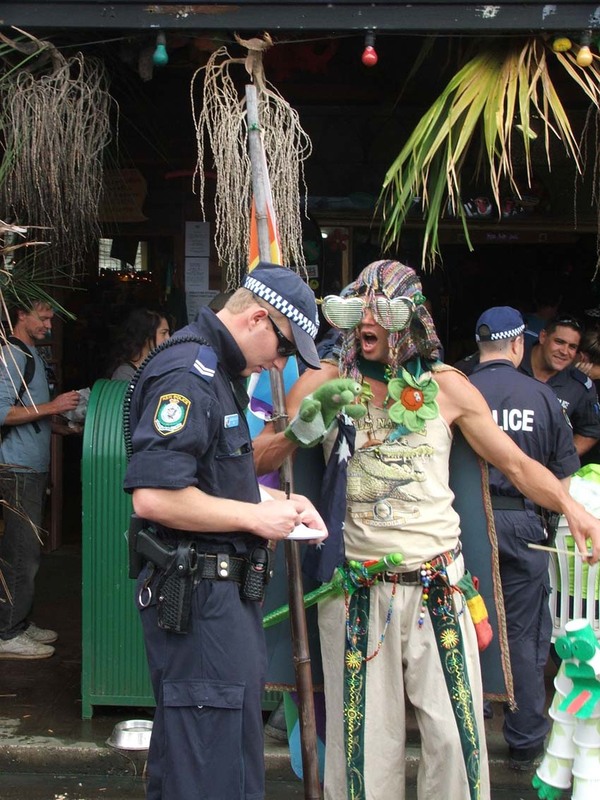 Presently some Nimbin community members are locked in a court battle to stop the roadblocks and raids on Nimbin each year but they do not expect that the action will be decided by MardiGras. In the meantime if you are thinking about bringing illegal drugs with you, be careful of roadblocks. They have three favourite spots - at Goolmangar, on the Nimbin Lismore Road to the south; Blue Knob Road near the cemetery on the road north; east from Nimbin near the corner of Tuntable Creek Road and the road to Mount Nardi. But they could be anywhere! Anyway let us hope for good behaviour from us all in this, the 20th MardiGrass. Hemp-EaZe Healing At The ROOT of the Problem. Hemp Root Therapy Cream with a 9 herb formula is made to relieve muscles and aching bones, reduce swelling and ease pain. 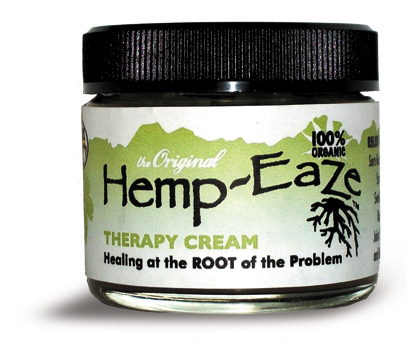 Hemp-EaZe rejuvenates circulation, promotes cellular growth, and encourages deep tissue healing. Our therapuetic cream is used for the treatment of Arthritis, sprains, joint pain, as well as, breaking down bruising, mending wounds, and relieving the discomfort of skin ailments. Darcy Stoddard has assisted her local holistic health clinic in the treatment of their neuropic patients with Hemp-EaZe. The Therapists have been encouraged with the results achieved when applying our cannabis root based cream. Hemp-EaZe also rejuvenates circulation, promotes cellular growth, and encourages deep tissue healing. Cannabis root extract has relieved pain and swelling, working deep to help with Arthritis, joint pain and stiffness and as remedy for skin problems and infections. The local holistic health clinic has included the preparation in their clinical study and is currently treating 24 patients with excellent results. The healing properties of Hemp-EaZe have provided a solution. 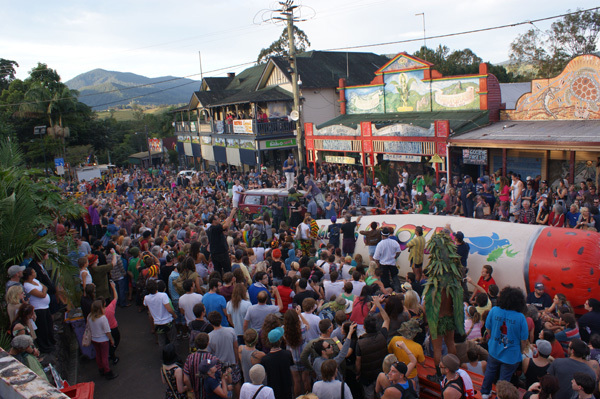 Copyright � 2012 Nimbin MardiGrass Organising Body Polite Squad Media Unit.